Artists can be picky when you photograph their work for reproduction. And who can blame them? Color is their world and any deviation from the vision can change the emotion of the art. Take a measurement of the art. The lights should be at a distance as an equilateral triangle that is longer than the diagonal dimension of the art to be photographed. If you have extremely large art you can stack another umbrella light over the first to get taller coverage. If you are photographing art of varying size set up for the largest piece and work your way down. You won’t need to change the set. Lights on umbrellas should be facing the CAMERA. We are lighting the flat art with the spill from each umbrella. This makes it extremely easy to get the light falling on the art to 1/10 of a stop over the entire suffice with virtually no effort. If you have set the lights at the same power and height according to the diagram you will get even lighting. Set up flags so that the light doesn’t flare the lens since the lights are pointing toward the camera. Very necessary for correct color is to use the proper tools. Take a set of flash meter readings to ensure the light is within even across the art. Use that reading on your camera. One possible way to attain a solid white balance is to make an exposure with the expo disk in place in front of your lens with the metered settings from the artwork’s position. Use that exposure to set a custom white balance on your camera. I’ve linked here to the largest disc as you can hold the disc over your lens. If your largest lens is smaller you can order a different size. 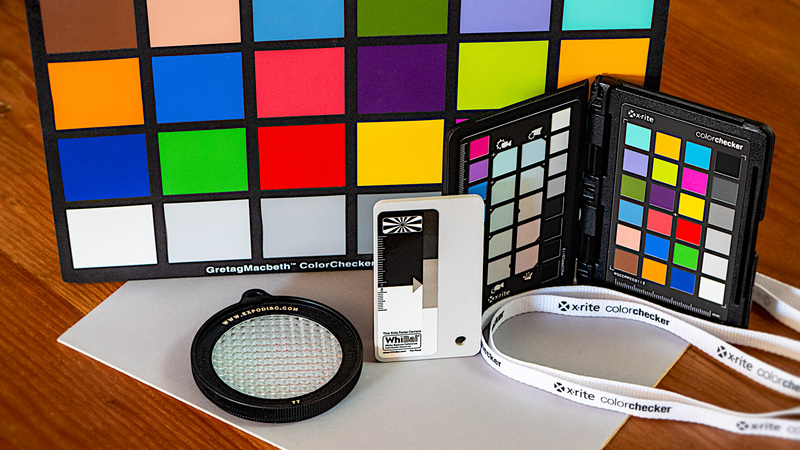 If you want to be very accurate (and show the artist) You can work to a color standard such as the xRite ColorChecker Passport Photo 2 (latest version) If I had to have only one of these color tools in my box this would be it. Place the Color checker in the frame of the first image capture. You can use this frame to set your color in post production. Once you have tweaked any settings they can be applied to all the other images from the session. Make sure you are capturing images in RAW for the best results. Also from xRite is the original version of the Gratag Macbeth ColorChecker Card, now called the ColorChecker Classic Card. This is quite a bit larger than the Passport model. If you only photograph art occasionally, at the bare minimum you will need to white balance properly. The Expo Disc has been mentioned but there are color correct gray devices to put in your scene such as the Kodak Gray Card or WhiBal Pocket card. If you are shooting artwork with glass or with highly specular highlights from the paint or glazes set up a black background behind the camera and cover the tripod with black velvet. Make sure there is no spill from the lights on the black background to keep it dark. Get out of the way and trigger the camera with a remote. There will be no reflections or any light for the artwork to “see” hence no glare or specular hot-spots to deal with. The color will be spot on since you are using a custom white balance. If you are shooting through glass you will have to clone out the reflection of the camera lens. Make sure you look for it. Since I have been using this system I no longer have issues with shifts in color from hot spots or polarizing filters. And, most important no more fighting with artists about getting the ‘right’ color. Before there were always problems, no more. Try it you’ll like it! Any questions give me a shout in the comments below. Bob is a Lens Based Artist and has had the honor and privilege to author books and articles on photography and has presented seminars and programs from Hawaii to the Caribbean. As a former Panasonic Lumix Ambassador he has been able to stay up with the latest technology in the Micro Four Thirds cameras. Coates is a successful commercial and fine art photographer based in Sedona, Arizona with his wonderful wife who makes it possible for him to do all he does in the photography industry. Need a speaker? Get in touch. Great article! There is one more thing I learned that makes a huge difference in oil paintings. Because the 3d effect of the thick paint is often a key part of the artistic look, I add a third light above and in front of the art piece. It gets boosted a fraction of a stop higher than the side lights and provides a very subtle highlight in the paint texture. It takes the oil paint from flat to amazing. Great addition. This was geared to flat art. Your idea can also be applied to mixed-media art that has texture and you want to add the 3D depth and dimension.Light can be added to the side etc. Thanks for your thoughts!